One of my favorite holiday traditions is putting in a CD of Christmas tunes, donning an apron, and hitting the kitchen. I start whipping up all sorts of baked goodies as Christmas gifts for loved ones and neighbors. It doesn't take long for wonderful aromas to fill` the house, as I sing along, stirring, sifting, and mixing. I love cooking so much and especially enjoy it during the holidays. Since this is my favorite time of year to hit the kitchen, I was thrilled when given the chance to review Nielsen-Massey Vanillas' A Century of Flavor. This is a fantastic cookbook! It is filled with beautiful photographs, easy to understand recipes, and oh my does it have some delectable food inside! There are recipes for everyone from the beginning cook to the experienced chef. Many can be made with minimal prep and fuss. I love low fuss! If you want to make something more adventurous, they have that too! I made the most marvelous scones I've ever eaten with a recipe from this book. 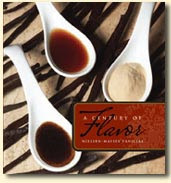 A Century of Flavor is going to be treasured in my kitchen for years to come. Check out these amazing recipes! Preheat the oven to 400 degrees. Wash the sweet potatoes and lightly coast the skins with canola oil. Pierce each potato several times with a fork. Place the potatoes on a foil-lined baking sheet. Bake for 1 hour or until fork tender. Cut the hot potatoes into halves. Scoop the potato pulp into a mixing bowl, discarding the skins. Beat at medium speed for 1 minute using an electric mixer. Add the cream cheese, butter, syrup, vanilla extract, salt and pepper. Whip until creamy. 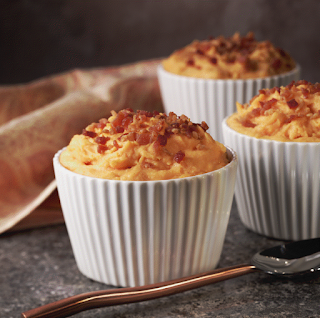 Spoon the whipped potatoes into six ramekins coated with nonstick cooking spray and top with the bacon. Place the ramekins on a baking sheet. Bake in a preheat 375-degree oven for 5 to 8 minutes or until heated through. Alternatively, they may be reheated in a microwave for 2 to 3 minutes. Preheat the oven to 350 degrees. Coat an insulated cookie sheet with nonstick cooking spray. Cut the dough log into ¼-inch-thick slices and place on the cookie sheet. Bake for 10 to 12 minutes or until golden brown. Cool on a wire rack. Place the cooled cookies on a parchment-lined cookie sheet. 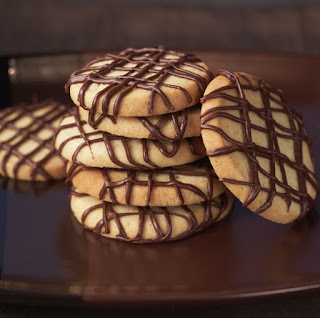 Variation: Add ½ teaspoon of any Nielsen-Massey Pure Flavor Extract, such as Chocolate, Almond, Lemon, Orange or Coffee, to the cookie dough to create a signature cookie. They make your mouth water, don't they? I bet you'd love to read more of these wonderful recipes. You are in luck, as I have three of these fantastic cookbooks to share with my readers! All you have to do to enter is head over to Nielsen-Massey Vanillas, then come back here and leave me a comment with something you learned or a recipe you'd love to try. The cookies look delicious and very festive. I would love to try these. I learned that a few drops of vanilla in a can of paint will eliminate odors! The Honey Citrus Pork Roast looks amazing. I'd love to make the Double Lemon Cheesecake. I just printed out the recipe for Double Lemon Cheesecake and will be making that this week along with the Crisp Vanilla Butter Cookies. The Seared Scallops with Vanilla Sauce sounds amazing to me. Vanilla and scallops are two of my favorite things, and I never thought of combining them. I'd love to try the Pumpkin Cake with Spiced Whipped Cream, thanks! i want to try the pumpkin cake with spiced whipped cream! love to try the shrimp kabobs! I learned that a few drops of vanilla in a can of paint will eliminate odors! Great tip !! The largest producer of vanilla is Madagascar! Ellen Easton's Almond Honey Pound Cake sounds really good. The Double Lemon Cheesecake sounds good. The recipe for Gingerbread Tea Loaf sounds great!